In this part of my Java Video Tutorial I show you how to create classes in Java. I cover Java fields (class variables) and methods (functions) first. I then explain what a private field is in detail. We then move on to what it means to overload a method, what a constructor is and how to overload a constructor. Don’t worry. It sounds much more complicated than it is. 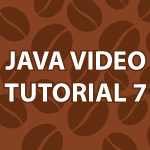 You should however check out the previous tutorials before you try to learn this stuff here Java Video Tutorial. Great video series for java ,Thank You Very Much sir for this videos,I’ve learnt java accurately by your video series. but i have problem with the ” passing arrays to methods” concept.Here is the code which i tried . Is there something special that needs to be done to get this to work on NetBeans? Class variables/fields are different than private fields? I’m trying to make this work in my brain. All monsters will have a TOMBSTONE I follow that. Then you have the health, attack, movement, x and y position and alive boolean listed next as private fields. Why are they not also final? If the word private means they are treated that way then why not privatize the TOMBSTONE? I think I’m stuck on the difference between each and all. All monsters will have a TOMBSTONE when they die but each monster has health… is that the difference? I really love your videos. I first came across your videos while doing python. Your python videos are fantastic. I have an exam next week on java so I’m watching your videos day and night. I’m having a problem understanding the toString method. Can you give me some advice. Every class you create is of type object. So, every class you create comes with the toString method by default. When your code tries to print an object it will print to screen whatever you define in toString. So, by defining it you can decide what prints out. Does that help? Firstly, thanks for your reply. You have given me some hope. I understand somewhat but can you give me a bit of code showing how it is used. I don’t quite understand the syntax. Thanks again. Right now you are my lifeline for passing my exam on Friday. I’m trying to figure out how to print the values in an array using the toString method. I welcome any suggestions or comments. Why can’t public String access the private int (attack) but in public void you can? I appreciate the work you do here. I am learning, slowly but surely. One thing I applaud you greatly is the fact that you take time and respond to the questions and comments. I admire you for that. Thanks for your effort! I do my best. Sometimes I get a little overwhelmed, but I get to all of them eventually. by the way, which is this your website or do you have another website? Just want to know where you prefer to be contacted for questions or comments. This is the only website I use for tutorials. I just wanted to say that you are doing an AMAZING job,your youtube channel is the best channel I’ve ever seen. Thank you very much 🙂 I appreciate you taking the time to tell me. Hi Derek on line 70 where it says the method has the same name as the class, is that supposed to say the constructor has the same name as the class???? the paramater in the video is written as the follow.